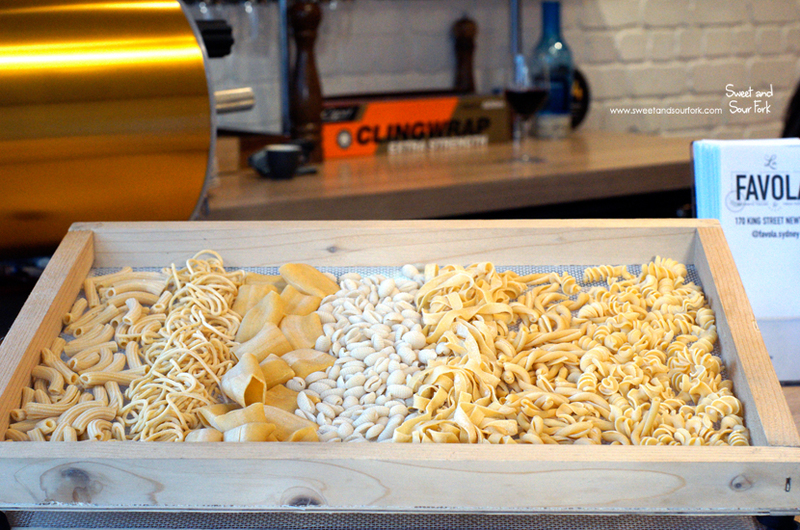 One year on, I’m still trying to find the perfect pasta in Sydney that doesn’t break the bank. Although I’ve had a few bowls here and there, I found that most of the time they’re either cheap and super inauthentic or pricey but only somewhat authentic. Admittedly I haven’t been looking around as much as I would have wanted to – at $30 or so per dish, it’s just a little bit out of my price range for casual meals. 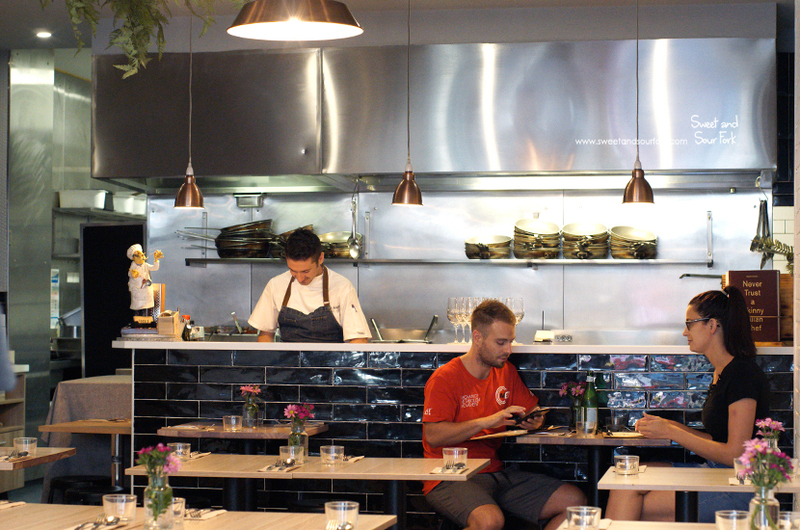 But last year, La Favola burst onto the Newtown scene in a whirl of rave reviews, with bold promises of freshly made pasta and Authentic Italian, all for something like $20 a bowl – consider me sold. With a relatively refined menu bearing both antipasti and a succinct wine list, I was surprised by just how casual La Favola was. A hole in the wall opening right onto the noise and dust of King St, La Favola feels more like a run-of-the-mill café than the authentic Italian restaurant it’s billing itself to be. The image is complete with minimalistic wooden tables packed closely together, and the only décor coming in the form of small posies on the tables. But as we all know, looks can be very deceiving, and given how good the unanimously good the reviews have been so far, I was ready to be pleasantly surprised. I’d heard excellent things about the Carpaccio ($20), and despite not being all that into raw meat, I was feeling adventurous enough to give this a crack. 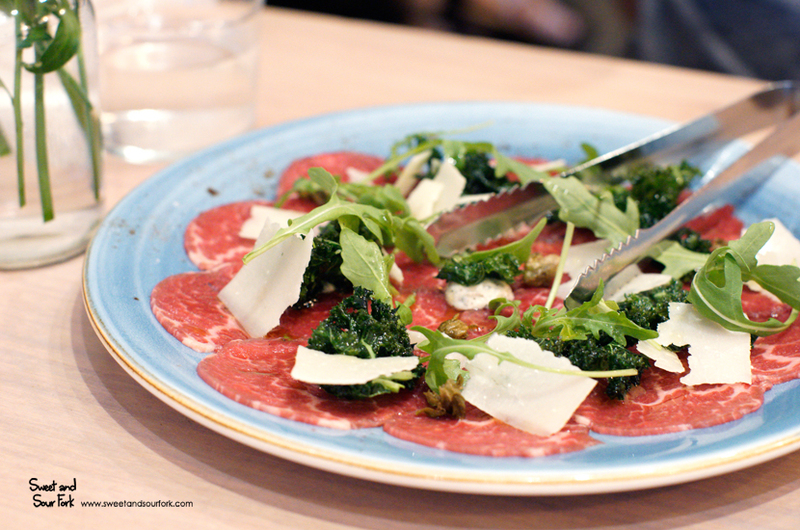 If you’re a little squeamish like me, this is a great entry into the world of carpaccio. The beef is thinly sliced, its mild butteriness a gentle backdrop for the sharp parmesan and musty truffles. The crispy fried kale was an especially welcome surprise, adding both texture and flavour. The only thing I would change is to add a little more acidity; the sparing usage of capers just wasn’t enough to balance out the rich components of the dish. 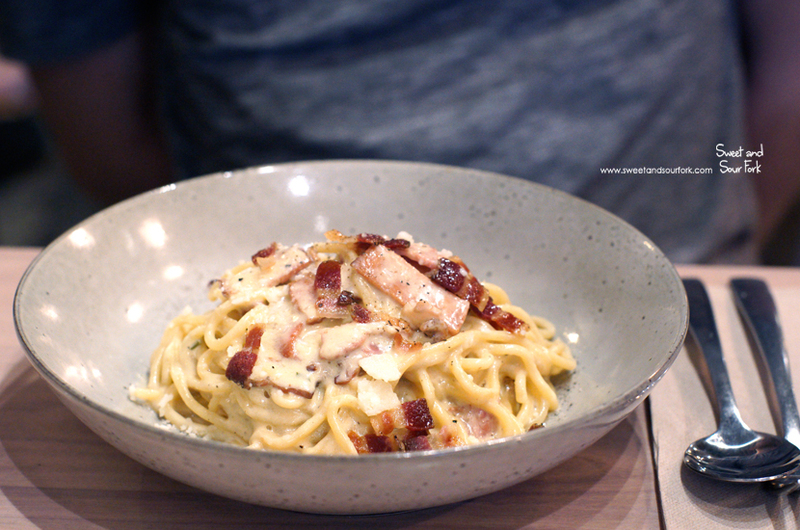 I’ve had a soft spot for carbonara ever since I had my first authentic, cream-less rendition at Umberto’s. And whilst the Fettucini Carbonara ($19) at La Favola does come with cream and bacon, there was also the option of having it in the authentic style with eggs and pancetta instead, which I jumped on gleefully. 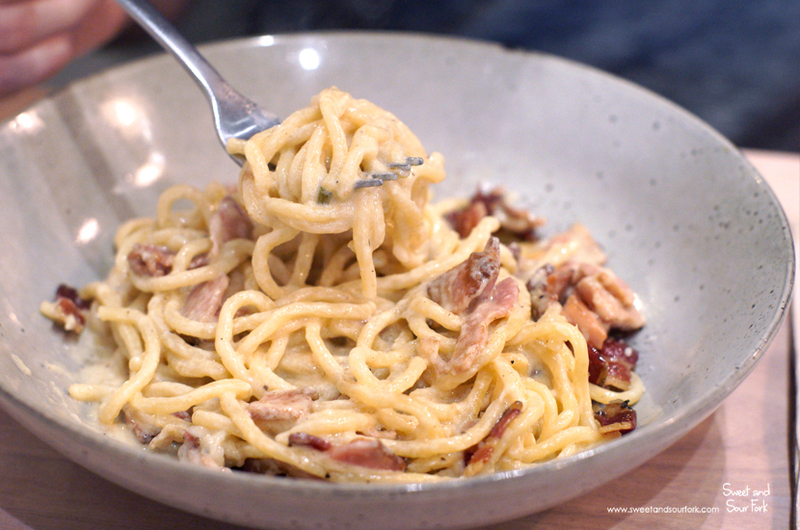 And before someone pedantic emails in; it’s true that real carbonara is made with guanciale, but let’s keep things realistic here – not only is pancetta much easier to get, it’s also basically the same thing to anyone that’s not Italian. Carbonara embodies everything that is so bad, yet so sinfully, unabashedly, and indulgently good. This rendition was no exception, the rich, salty sauce of egg and parmesan enhanced by the smokiness of crisp pancetta. This was especially good with the freshly made spaghetti, which is coarser and thicker than the dried variety, making the creamy slickness of the sauce even more apparent. My only complaint is the slightly heavy hand with the cheese and pork fat, which shifted the pasta from indulgent to cloying as you made your way closer to the bottom of the bowl. 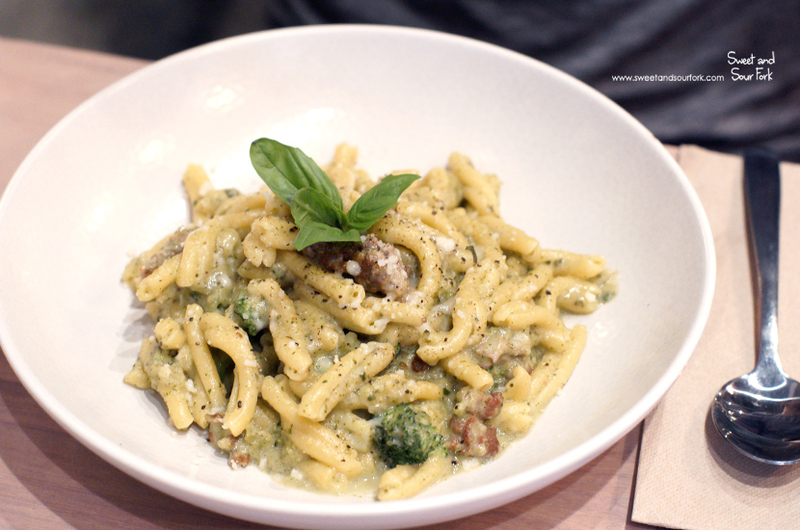 I’ll admit upfront that I was a disappointed by the Casarecce Broccoli e Salasciccia ($22). I had expected the classic combination of broccoli and sausage to have a flavour profile that was clean yet bold, the freshness crispness of the greens contrasting with the spiced pork against a delicately fragrant backdrop of a white wine-based sauce. Instead I found the broccoli to be cooked almost down to a slurry, and barely any sausage to be seen. And despite the liberal usage of cheese, the sauce had almost no character whatsoever, and verged on bland despite adequate seasoning. It wasn’t a bad pasta, and I finished this happily enough, but it was a far-cry from what it could have been. I came away from La Favola feeling reasonably pleased, but certainly not nearly as delighted as I had expected to be. Given all the excellent reviews, as well as restaurant’s promise of authentic Italian, I was expecting something with a little more pizazz. Although restaurant-quality, the pasta sits more on the home-styled end of things, where the focus is on comfort rather than innovation. I will concede that the hand-made pasta, especially the chunky spaghetti, was amongst the best I’ve had. There’s definitely a space in my restaurant repertoire for La Favola, but it’ll be for the days where I feel like something simple and tasty that doesn’t push any boundaries. Rating: 13/20 – not what it says on the packet.